Move over cupcakes. Frozen yogurt is the new favorite treat. You can serve yourself, mix and match flavors, and get exactly the amount you want. Then create your own masterpiece by choosing from a variety of toppings. Frozen yogurt is also a slightly healthier dessert choice since it’s non-fat, but that’s beside the point because it tastes creamy, sweet and delicious! So I was thrilled when a new Yogurt shop opened in Palencia. 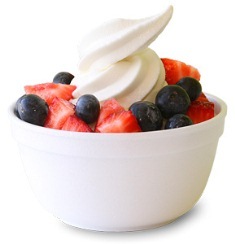 A few days ago my friend and I went to visit Yogurt Motion located in the Palencia Commons. We met the owner, Scott Sance, who was glad to talk to us about the new, self-serve frozen yogurt shop.